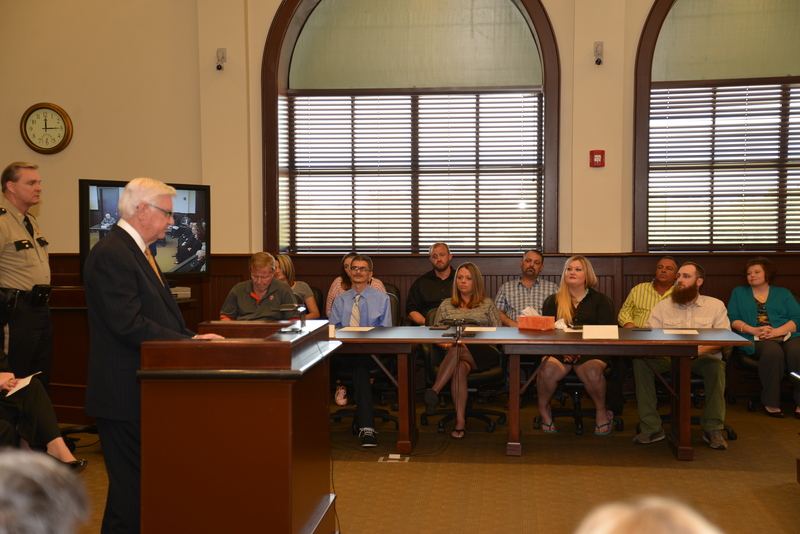 U.S. Representative Harold "Hal" Rogers and U.S. Drug Czar Michael Botticelli spent two days meeting with leaders and students in eastern Kentucky who are diligently working to combat the prescription drug abuse epidemic in the region. On Tuesday morning, WYMT-TV News Director Steve Hensley moderated a roundtable hosted by Operation UNITE at Eastern Kentucky University's (EKU) Manchester Campus with leaders from law enforcement, treatment and education, as well as medical professionals and recovering addicts. Several leaders said signs of improvements are finally being seen in some of the hardest hit communities, like Clay and Harlan Counties. Clay County Coroner Danny Finley reported overdose deaths have dramatically dropped from 23 in 2011 down to two last year. "Declining overdose deaths is our ultimate score card," said Congressman Rogers. "Saving lives is our number one mission." In Harlan County, Kateena Haynes, Director of the Harlan Boys and Girls Club, said so many students had lost a parent in 2011 that the club had to add grief counseling and develop a protocol for children while funeral arrangements were made for their parents. "Within a six week period, 13 of our students lost a parent to a drug overdose in 2011," said Haynes. "This year, we haven't had any kids lose a parent, so it is getting better." Local leaders recommended more education for prescribers about narcotic addictions, an adolescent treatment facility in eastern Kentucky, more abuse deterrent painkillers, and more assistance for babies exposed to powerful opiates by drug addicted mothers. "Education is the commodity that can heal all the ills that we face in this battle," said Dr. Michael Benson, President of EKU. During a celebration luncheon with about 500 attendees, Director Botticelli, Wendy Spencer, CEO of the Corporation for National and Community Service and Congressman Rogers joined Nancy Hale, President/CEO of Operation UNITE to present ten UNITE Community Coalition awards for innovative volunteer efforts to educate students and community members across UNITE's 32-county service area. Award winning programs included new approaches to prevention and education through efforts like the Pike County's "2 Smart 4 Drugs" academic team tournament, Owsley County's mentoring programs in the schools, and Floyd County's parenting classes for local inmates. Botticelli and Rogers also met with law enforcement professionals in Hazard from federal, state and local agencies. They discussed changing trends in drug abuse, including a rise in heroin overdoses in Kentucky, as well as concerns about marijuana legalization movements in other parts of the country. "A recent survey showed teens are now more likely to smoke marijuana than tobacco," said Botticelli, referencing a National Institute on Drug Abuse study that also reported 60 percent of 12th-graders did not view regular marijuana use as harmful, and more than 12 percent of eighth-graders said they had used the drug in the past year. Rogers and Botticelli also presented the 2015 "I Am UNITE" Scholarships to 24 students in southern and eastern Kentucky. 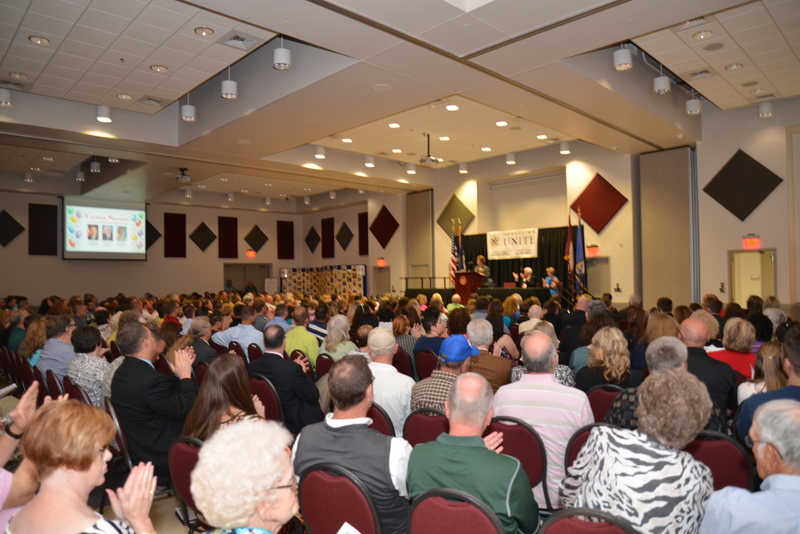 The scholarships are worth $1,500 for high school seniors who have volunteered for UNITE events or have persevered throughout high school despite drug abuse in their families. "You don't have to wait until you are an adult to become a leader - leadership is defined by your actions, regardless of age," said Rogers. "I can say with confidence, that every student here is a leader and you have a very bright future ahead." 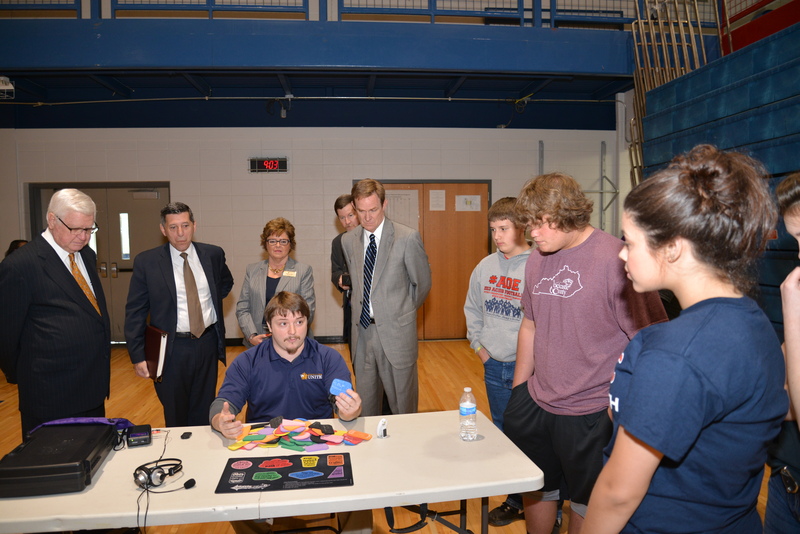 On Tuesday, Rogers, Botticelli and Spencer visited Rockcastle County High School to witness drug abuse prevention and education efforts in action. 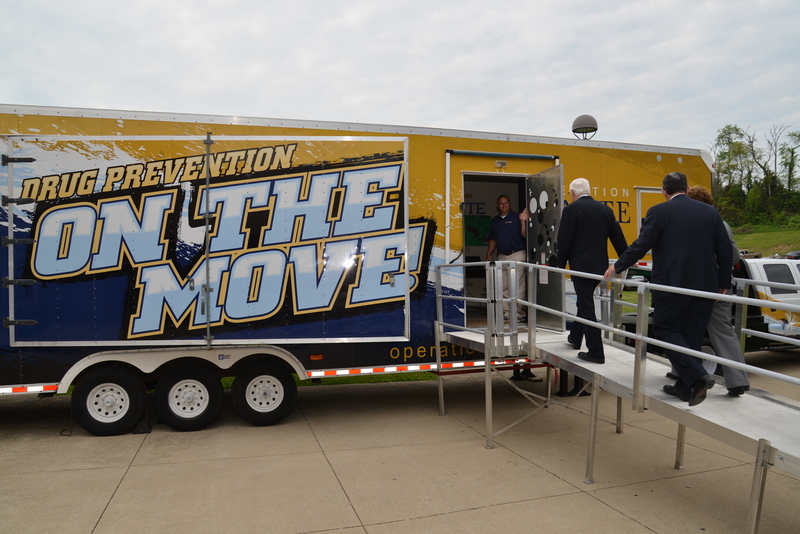 Operation UNITE demonstrated its "On the Move" Mobile Education Trailer and "On the Move" Simulated Impaired Driving Experience where students learn about the effects of addiction first-hand. Finally, Rogers and Botticelli attended the 28th Judicial Circuit Drug Court Graduation. Thirteen participants graduated from Lincoln, Pulaski and Rockcastle Counties. "We need to thank all of the employers who give addicts like us a second chance," said Botticelli who is recovering from alcoholism. "I encourage you to stay strong, stay focused and stay connected." "You have already overcome and experienced a remarkable change," said Rogers. "Today, you rise in this courtroom, not to face penalties, but to enjoy freedom and a new beginning outside these walls." The Laurel County UNITE Coalition won the "Youth Activity Award" for its strong Hooked On Fishing-Not On Drugs program. The Owsley County Anti-Drug Council won the "Youth Mentoring Award" for its innovative mentoring program called "Engage," targeting middle school and high school students. The Rockcastle County UNITE Coalition won the "Community Partnership Award" for its strong, dedicated group of volunteers across the public and private sectors. The Champions UNITE McCreary County Coalition won the "Youth Empowerment Award" for its commitment to addressing substance abuse issues through youth and family programs. The Pulaski County UNITE Coalition won the "Above and Beyond Award" for volunteering countless hours for various community prevention and education efforts, including the National Rx Drug Abuse Summit. The Boyd UNITE Champions Coalition won the "Volunteer Leadership Award" for its efforts to turn grief in to action by launching a strong coalition as a result of overdose deaths in the county. The Floyd County Citizens Against Drug Abuse Coalition won the "Recovery Outreach Award" for its activism for recovery programs over the last six years, including parenting classes for inmates at the Floyd County Detention Center. The Clay County UNITE Coalition won the "Project Innovation Award" for its innovative drug prevention and education efforts in the schools, including attendance rewards, a positive behavior program and several sports opportunities. The Knox County UNITE Coalition won the "Youth Service Award" for school programs that both mentor and educate students with sports and other fun programs. The UNITE PIKE Coalition won the "Community Outreach/Aftercare Award for its community partnerships and prevention efforts in the schools, including a "2 Smart 4 Drugs" academic tournament.